NEWS ANALYSIS: Criticism flew, the main players including Finance Minister Siv Jensen fought off exhaustion, the government coalition was arguably weakened and lots of Norway’s oil money was ultimately approved to finance it all. Norway’s state budget for next year finally cleared Parliament on Monday, but the price was high for all involved. 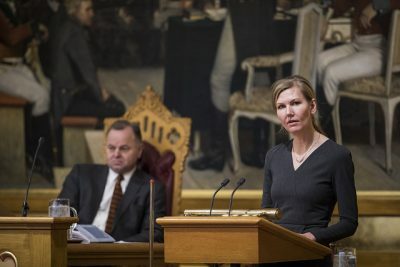 Finance Minister Siv Jensen, wearing the same dark blue lace dress she wore when she first presented her government’s much-contested state budget proposal in early October, gamely took the podium in Parliament on Monday to address the critics. She was also back on national radio early Tuesday morning, sounding tired, but still defending the budget that actually has boosted her Progress Party’s ratings in public opinion polls. “There have been real political battles,” Jensen said on state broadcaster NRK’s morning political talk show Politisk kvarter, denying suggestions by some commentators that the last two months of dramatic budget negotiations were staged. 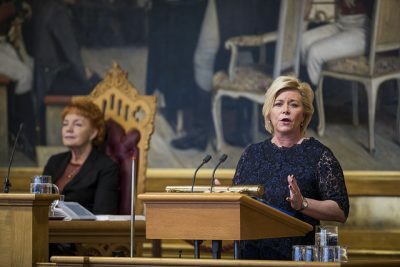 She chose to focus on the fact that Norway’s two-party minority government coalition (the Progress Party she leads and Prime Minister Erna Solberg’s Conservatives) finally did come to terms with its two small support parties in Parliament (the Liberals and Christian Democrats), averting a government crisis that loomed in addition to the budget crisis. “We have respected each other’s limits,” Jensen insisted. “Everyone has clear limits.” Her party’s limits came in the form of a package of changes in taxes related to driving, which included a slight increase in fuel taxes. That was as far as they’d go, however, setting off the budget crisis after both support parties accused the Progress Party of making an ultimatum. The Liberals and the Christian Democrats continued to criticize what Jensen called “the so-called ultimatum” during debate in Parliament on Monday. That illustrated how conflicts persist within Solberg’s minority coalition, which some argue has been seriously weakened because of the autumn’s budget crisis. Newspaper Dagsavisen reported Tuesday that the two support parties are now much more free to form a majority with opposition parties instead of the government parties. Their budget conflict ended, according to Dagsavisen, with a more limited cooperation agreement than the one signed four years ago when the coalition was first formed. Dagsavisen noted how that new freedom can cause more trouble for Jensen and Solberg, if the Liberals and/or the Christian Democrats side with the opposition Labour Party on proposals to hammer out a new tax on financial services, for example, and to scrap or dramatially modify tax-free sales for Norwegians traveling abroad. Those battles are set to come up in the spring. 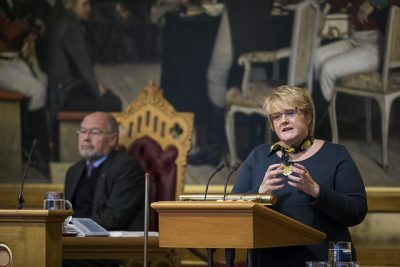 Labour also complained that the new budget, approved solely because of the last minute compromise worked out between the government and its two support parties, “takes away a half-billion kroner” from Norway’s state-run hospitals and that, according to climate researchers, the parties involved have exaggerated the climate effects of their budget. Instead of cutting more than 600,000 tons of carbon emissions, it’s argued, budget measures will cut around 200,000 less. In short, disagreement and drama over the state budget will rage on despite its formal approval on Monday after an all-day debate. Questions are also flying over whether the messy budget process has permanently damaged cooperation between the minority coalition and its two support parties. Both the Liberals and the Christian Democrats remained unhappy over not just the “ultimatum” they ultimately swallowed but still-unsatisfactory climate policy compounded by the rhetoric of Immigration Minister Sylvi Listhaug, who’s busily following through on much tougher asylum and immigration policy. Despite Solberg’s best efforts to keep her team intact, sharp divisions remain. Per Sandberg, one of the Progress Party’s most outspoken top politicians who also serves as Fisheries Minister, claimed that he “wouldn’t have shed any tears” if there was no budget compromise and the government fell. Some other Progress Party veterans also urged that leaving their very first government would be better than bowing to more compromise. Neither Solberg nor Jensen, however, had been prepared to let their government fall over the budget disagreement. Solberg told NRK that she hadn’t written any farewell speech, since she was confident a budget pact would be reached, as it was on Saturday. Jensen said Tuesday morning that she and her national board remain keen to achieve more as part of the government than as part of the opposition. 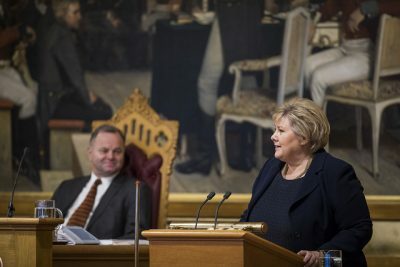 Jensen and Solberg are also keenly aware that there’s still a non-socialist majority in Parliament and both parties actually emerged from the budget chaos with better standings in the polls, despite all the quarreling. NRK’s “party barometer” for December showed the Progress Party jumping 2.9 points to 16.5 percent of the vote, more than what won them the election in 2013. The Conservatives gained 1.5 points to 25 percent of the vote, while Labour fell 3.6 points to 33.8 percent. Labour remains the single largest party, and is likely to team up with the Center Party (7.2 percent) once again in the hopes of forming a new government coalition. Another poll released by TV2 also showed gains for the Progress Party, and for the Greens Party as well. It suddenly emerged with 4.5 percent of the vote, more than either the Liberals or the Christian Democrats. If those numbers were election results, the Greens would rise from having just one representative in Parliament (Rasmus Hansson) to eight. That would put them in the powerful position of tipping the vote on a variety of issues, and likely make any state budget much “greener” than those proposed by either a Conservative- or Labour-led coalition.